One Loaf of Light Rye Bread with Sunflower Seeds! 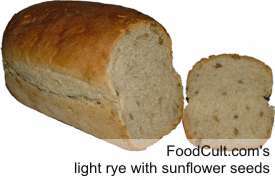 Now let's go make a loaf of this delightful, light rye bread with sunflower seeds! Sprinkle yeast onto warm water and let sit a few minutes. Add about 1/2 of your sunflower seeds and 1 additional cup of flour and work it in. Then work in 1/2 cup at a time only until the stickiness is gone from the dough (adding no more than 1/4 cup at a time as you come near the end - working the dough by hand once it becomes too hard to work with the spoon). Note: Add flour only until the stickiness is gone. Form the dough into a flat ball and lightly rub a thin coat of oil over the surface of the dough. Then return the dough to the mixing bowl and cover it. Turn dough out onto your (lightly floured) work surface. Press the bubbles out of the dough - flattening it into an oval shape. Cover it with a dish towel and let it rest for about 5 minutes. Spread some seeds down the middle 1/3 of the dough and pulling one side, fold it over. Spread the dough out into a flat oval as much as you can and fold it once again pulling one side one third of the way and then folding the other side, then pulling up the bottom third and folding the last, top third down. The dough will be hard and not want any further kneading. Having folded the dough down, pinch the seam along the length of the dough by rolling the dough under your curved hand - pressing the seam, with the heel of your hand, against the work surface. The dough will gradually lengthen allowing you to work with both hands. Be sure to pinch the seam running the length of the dough tightly closed with the heels of your hands. In some cases, the seam will disappear fully as the dough is rolled out ... and that's okay. Pinch the ends tightly closed. Having rolled the dough out just slightly longer than the pan you will use, the dough may be bent, slightly, to place into the loaf pan. Place the loaf seam-side down. Cover the loaf with a piece of parchment paper (or wax paper although it sticks a little more) and let rise in a warm, draft-free place for 50 minutes or until double in bulk. To soften the crust bag your bread in plastic for a minimum of 4 hours ... or even more. A special note on flours: If using organic or other un-preserved/un-treated flours about 1 tablespoon of lemon juice per loaf is recommended. Mostly oil free, this loaf of about 1.5 pounds (around 600 g) has only one teaspoon of salt and one and a half teaspoons of sugar. You may always elect to make small adjustments based on personal preference but this vegan loaf is a great sandwich or snacking bread (although not, necessarily, a great dipping bread). For Jewish bakers this recipe is kosher and pareve, and it is halal for Muslims. What it is not, is a European Deli Rye. Unlike European rye bread, this is not a sourdough bread. It is a standard, western style, yeast-raised bread. This means it will have a more western texture - unlike the often dense and/or more moist German rye breads (Sonnenblumenkerne Roggenbrot or "Sonnenblumenbrot"). A squeeze of lemon, however, will add a slight hint of sour to your home made, yeast raised, Sunflower Seed Rye Bread. Going forward, you can try adjusting the amount of rye you start with. Naturally, your white flour usage would have to be adjusted accordingly. We suggest increasing your rye 1/4 cup at a time - tasting at each baking to see how much that small substitution will have affected the taste and texture of your loaf. Is all this reason enough to make this bread a regular part of your diet? Well, Sunflower (as a seed and as an oil) is credited with (take a deep breath): Fighting inflammation, preventing cancer, benefitting the skin and being heart-healthy. Vitamin E may well be, in fact, a powerful contributor in all these three areas ... and sunflower seeds are a vitamin E powerhouse as well as being a source of selenium and dietary fiber. Sunflower seeds? Good! Besides being healthy AND a very tasty loaf, we like that slight chewy-not-quite-crunchy texture of all those seeds baked into this gentle rye bread. This bread, while not a deli loaf as we, in this house, know it; is a delightful bread for toasting or with cold cuts or for almost any other sandwiches. It even makes a really interesting Grilled Cheese Sandwich. Of course, as with most of our recipes, pretty much no special tools are required to make this light rye bread with sunflower seeds. This sunflower seed rye bread recipe finds its roots in our Basic White Utility Loaf. The methods, however, for the second kneading (by stretching and folding the dough) and shaping the dough (by rolling the dough out under curved hands) are much like techniques used in making such French breads as baguettes. Small adjustments are made to accomplish certain flavour and texture objectives but in fact, many flavours and variations can be accomplished with that simple, basic recipe in mind.